Coach Conrad Ray called it "an awesome day for the program". Tiger Woods tweeted after Joseph Bramlett finished his round - "Amazing feat considering he sat out a whole year with wrist injury. Can't wait to play with him next season." Joseph said "I don't think I've ever heard my dad cry before" when interviewed after the final round. Two Stanford golfers have made it to the PGA Tour, Zack Miller '07 (tied for 4th) and Joseph Bramlett '10 (tied for 16th). Here is the leaderboard for the entire final stage of the PGA Tour's Qualifying School and a thumbnail on each of this year's tour qualifiers. For the 22 year old Joseph Bramlett, success was historic given his mixed race parentage with an African American father. Joseph became the first African American in 25 years to successfully advance through the final stage of Q-school to earn a PGA tour card. He also becomes the first African American to join Woods on Tour during the Tiger era. Joseph was featured in an in depth article on the PGA Tour's website., in a NY Times article, in Golf Week, in the SJ Mercury and in this article in Golf.com. Joseph came to Stanford after a brilliant junior career that included qualifying for the US Amateur at age 14, at the time he was the youngest to ever do so. His freshman year he won All-American honors helping Stanford to the 2007 national championship. His next two seasons were marred by wrist injuries while his senior season found him able to compete once again. Joseph started his final round tied for 33rd, 2 shots off the cutline at 7-under par and compounded the challenge by bogeying two of his first three holes to drop to 5-under. What followed was nothing short of sensational as he reeled off 7 birdies including 5 in a row from holes 8-12. A 12-foot birdie putt on the par 5 17th moved him to 11-under and a clutch 7 footer on the tough 18th to secure his card tying for 16th. His rounds were 67-73-69-69-72-68 (T-16). 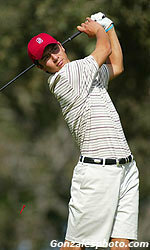 Zack Miller '07, captained Stanford's 2007 national championship team when Bramlett was a freshman All-American. Zack has steadily built his game since graduation and enjoyed a successful Nationwide Tour season this year. Zack had rounds of 70-68-67-68-71-71 (T-6) to finish tied for 6th at 14 under par. His final round was solid with two birdies offsetting two bogies. The Golf Channel telecast captured a 40-foot birdie putt on hole 14, shown below, and his great up and down from the front bunker on the tough 18th hole where he drained a 6-foot final putt. 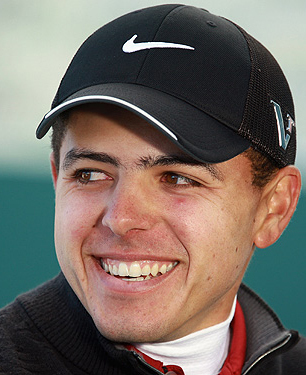 Zack finished 56th on the Nationwide Tour with more than $121,000 in earnings. In the 2009 PGA Q-School he made it to the final stage where he finished in 90th place to earn his Nationwide Tour card. The video below shows Zack rolling in a 40-footer on the 14th hole of his final round. I had the pleasure of playing a member-golf team round with Joseph Bramlett at Stanford in 2009 and it was the finest round of golf I've ever witnessed -- Joseph was a pleasure to spend time with throughout his great round. He had 5 birdies, 2 eagles and shot a 63 despite missing a number of putts inside 12 feet. I first met Zack Miller when he was 18 having just graduated from high school. Zack was playing with my son (I was caddying) at Pasatiempo (in Santa Cruz, CA) in a US Open qualifier and he displayed a superb all-around game in successfully moving to the next round of qualifying. Equally impressive was his demeanor and engaging manner, traits that continued as I followed his progress at Stanford. WINTER GARDEN, Fla. -- More than a decade after Tiger Woods became the first African American to win the Masters, another black golfer with mixed race parents who learned the game by emulating the swing of his father in a mirror and later matriculated at Stanford University cut his own little slice of history. 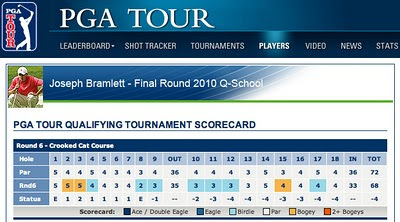 Monday, Joseph Bramlett became the first African American in 25 years to successfully advance through the final stage of q-school to earn a PGA TOUR card for 2011. He also becomes the first African American to join Woods on TOUR during the Woods era. The parallels to Woods and the social significance of the moment are striking. They also weren't lost on Bramlett, his father Marlo and certainly not on Adrian Stills, previously the last black man to make it to the TOUR this route. "I don't think I've ever heard my dad cry before," said Bramlett, who finished in a tie for 16th at 11 under at Orange County National. "It's been too long. To finally end that 25-year drought means the world to me, my family and everyone who has helped me along the way. It's an honor, it truly is an honor. Like I've said before, it's been a long time. I'm just thrilled to see it start to change." And no one helped Bramlett get to where he is today more than his dad. As a young boy, Bramlett kept a club in his crib and by three years old he was hitting golf balls with his dad in a soccer field near their house in Saratoga, Calif.
Later, he would become the youngest player at the time to qualify for the U.S. Amateur at age 14. Eventually, Bramlett helped Stanford win the NCAA men's team title in 2007 before being sidelined for nearly two years by two wrist injuries. Earlier this year, Bramlett graduated from Stanford (in just under four years, no less) and the next day was at Pebble Beach playing practice rounds for the U.S. Open with Woods, who he had a poster of hanging in his room as a child. Tiger Woods took notice of Jospeh Bramlett's performance, congratulating the soon-to-be rookie on making it through q-school via Twitter. Click here for more. Monday, Woods tweeted: "Congrats to Joe Bramlett for making it through q-school. Amazing feat considering he sat out a whole year with wrist injury. Can't wait to play with him next season." But Woods wasn't the only one watching. Up the West Coast of Florida, Stills arrived home from his job as the head professional at the Osceola Municipal Golf Course in Pensacola early on Monday, eagerly tracking Bramlett's progress on his laptop while watching it unfold on television. Stills soaked in every second of the moment with "a sense of fulfillment and enjoyment." "I'm not an overly religious person, but I couldn't believe the timing of it being 25 years," Stills said. "I've been in that situation and shot 68 the last day of q-school with the heat on and that today was some good stuff." Stills' playing career might not have amounted to much -- he spent just one year on TOUR -- but he said the game of golf had given him an awful lot. He's returned the favor by more than 40 of years of involvement, much of which has centered on teaching and the The First Tee program. "The game lends itself to so many good things, it's important to have another African American out there," said Stills, who was inspired by players like Lee Elder and Calvin Peete, much the way Bramlett was influenced by Woods. "I don't know why it's taken this long other than it's a byproduct of interest in the game, a byproduct of junior programs not lending themselves to minorities. But I think with programs like The First Tee for the last 10-15 years we're going to start to see a transition. "I hope this starts another trend because it's important to our community." "There are some men coming up that are exceptional players that will make it," Marlo Bramlett said. "But hopefully we look at it one day we look at this deal as 156 golfers, and not 156 golfers and one African-American and three of Asian descent, just 156 players. "I hope we get there, I really do." Early Monday evening, Stills hadn't yet heard from Bramlett, though he said he might because someone had asked for his cell phone number in case Bramlett wanted to call. "What I'd like to say to him is you've proven you have the merit to be out there," Stills said. "Now do what you know how to do on that big stage." Bramlett, like Stills, will finally get that opportunity.